It sometimes so happens that an update is not installed properly, which delays the system startup. This problem often occurs at the time of a restart. You want to work faster again. Totally deactivating automatic updates is the wrong method, since you will then be taking unnecessary security risks. Instead, you can find out in the settings for updates as to which individual element causes problems and leads to delays when you try to install something. This update can then be blocked specifically. 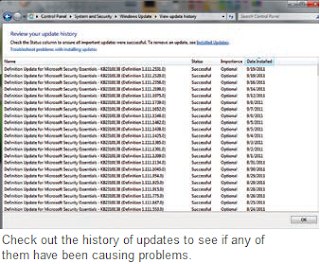 For that, click in the Control Panel on ‘System and security’, on ‘Security’ and then ‘Windows Update’. Follow the link ‘View update history’. In the ‘Status’ column, check which updates have ‘Failed’ and then check whether the relevant update with the same name (KN number) has been reported further up in the list as ‘Successful’. If an update has failed several times and if it is also the latest entry, there is clearly a problem, and you can block this update. For that, again switch to the ‘Windows Update’ page. Click the links ‘optional updates are available’ and then ‘important updates are available’. In the lists displayed there, search for the entry of the problematic update. As soon as you find it, right click it and select the context command ‘Deactivate update’. In future, Windows will not try to install this update automatically. If you however want to access it later, click the link ‘Show deactivated updates’. Then activate the desired entries clicking the link on the relevant checkbox followed by a click on the ‘Restore’ button. You will then have to confirm the User Account prompts.